The Chesapeake Conservation Center exists to promote a connection to nature and conservation of the bay in order to restore balance to our ecosystem. 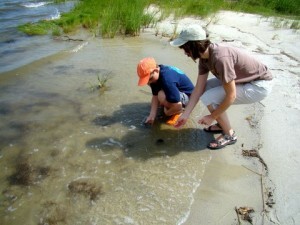 Our fun started in 2007 after Alex found horseshoe crab eggs at our community beach in Hillsmere Shores. He noticed movement in the tiny spheres hidden in the sand, which his subsequent research identified as the about-to-hatch eggs of Limulus polyphemus, the horseshoe crab species indigenous to the east coast of the United States. In 2008, Alex entered a national contest to better the life of an animal. He created an awareness campaign, essay, and logo, Planet Horseshoe Crab. His entry earned him a spot as a finalist and fueled him to do more for this amazing creature. Our family conducted rudimentary surveys of spawning horseshoe crab populations at Hillsmere beach, participated in Delaware Bay surveys, and began raising Chesapeake Bay horseshoe crabs through the Maryland DNR’s Horseshoe Crabs in the Classroom program. Alex’s passion for the amazing role of the horseshoe crab in the Chesapeake Bay ecosystem and in all of our daily lives led to the establishment of The Chesapeake Conservation Center, inc. in September of 2008. By 2009, Alex had developed PHC further, requesting to meet the mayor to discuss the role of the horseshoe crab in our ecosystem. The result of that meeting was 2 beautiful awareness information boards- now available for public viewing. One is at the Annapolis Maritime Museum, the other at Back Creek Nature Center. In 2009, Alex created another awareness campaign and logo, Diamondback Detour. As CC-Center continues to grow organically, awareness campaign curriculum is being developed to use in community based programs. The Chesapeake Conservation Center, Inc. is a not-for-profit corporation working towards 501 (c)(3) non-profit status. If you would like to join the public support for our efforts, please contact us. All photography, artwork, and logo designs are original and may not be used without permission.